I never did this before but I really wasn't satisfied with the card I posted and when I saw one of the comments that pretty much echoed my feelings, I decided to call do-over. I think the big problem with the first one was the picture was taken on a very grey day. 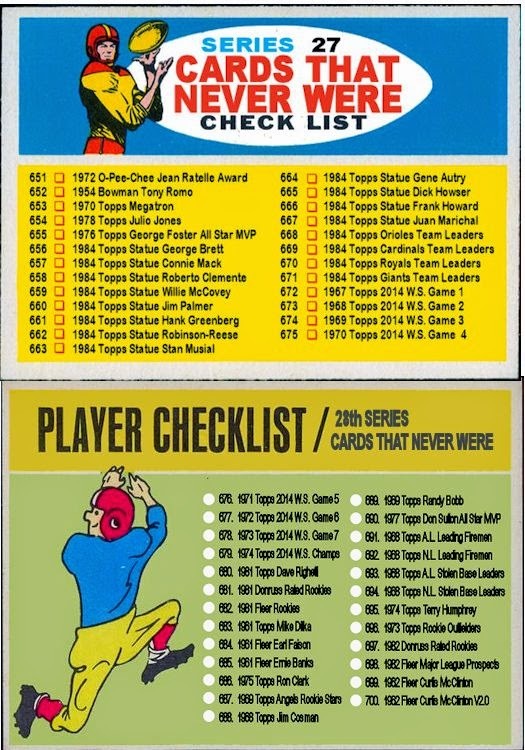 I used colors consistent with other Twin cards in 1967. 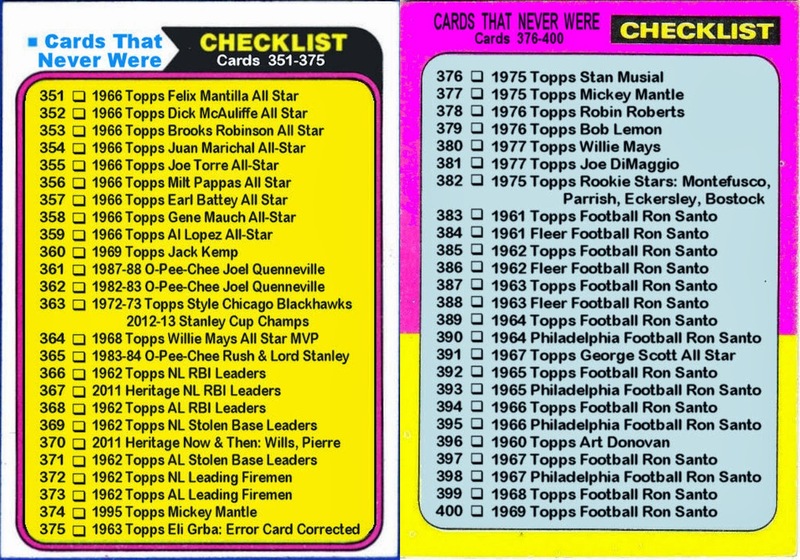 On a light background, Topps used black lettering which made it even worse. Also I slanted the signature downward which is the way it was slanted on the source I lifted it from. 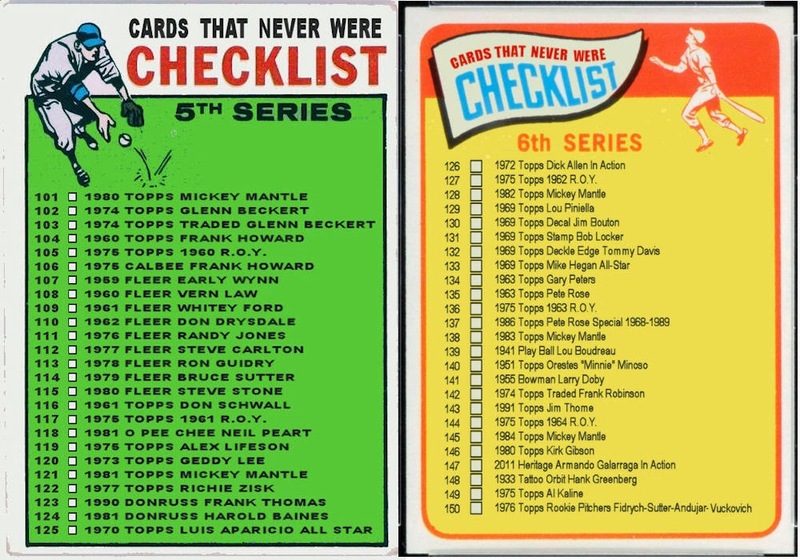 But as Baseball Brent pointed out very few cards have the signature slanted that way. It's cool to make cards that other people like, but ultimately I do this for my own amusement. So thanks, Brent. I didn't like that card either. I am much happier with this version. 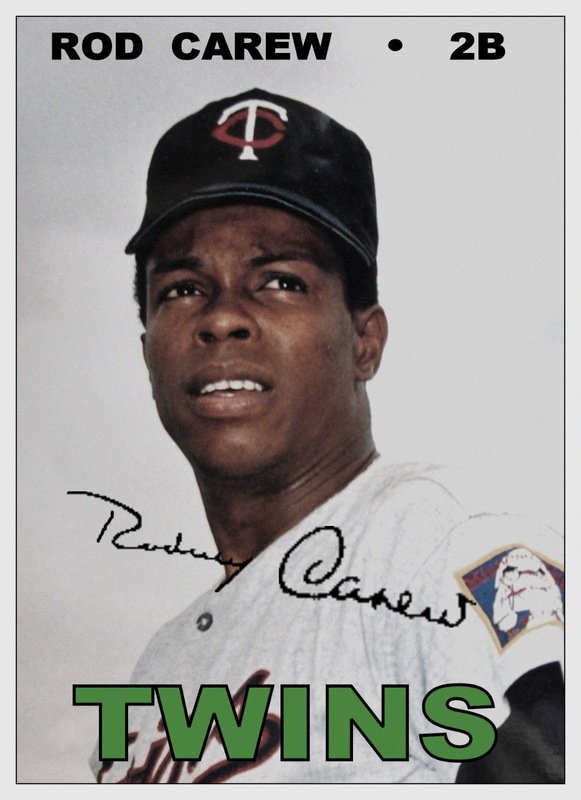 Rod Carew's first MLB game was as the starting second baseman on opening day 1967. He went 2-4 as the Twins lost to the reigning World Series Champs, the Baltimore Orioles. He would also start at second base in the All Star Game that season. He would be selected to the All Star team every year for the 18 years in a row. 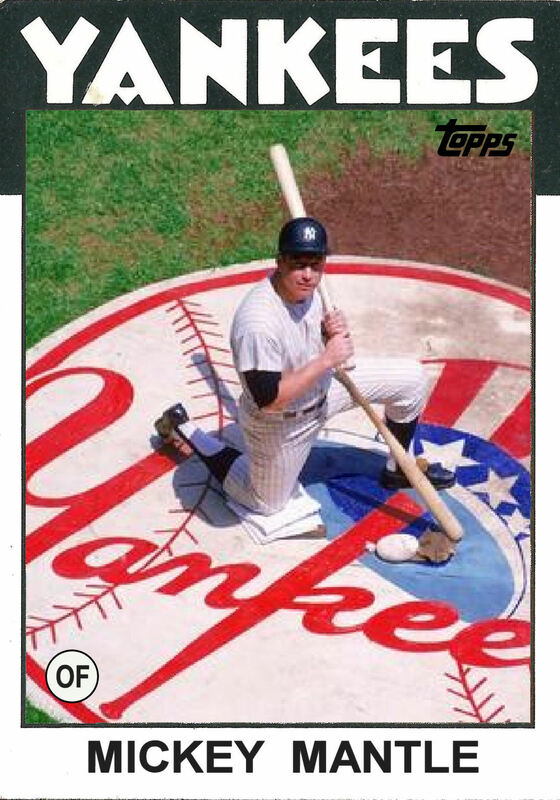 Only in his final year, 1985, he did not appear in the All Star game when his batting average dropped to a meager .280. 48 points below his career average of .328 and over 100 points below his career high of .388 in his MVP season 1977. It's Memorial Day weekend so this is my little tribute to fallen ballplayers. Five Major League Baseball players died while in service during World War I. Of the five only 2 played any significant amount of time. Larry Chappell and Eddie Grant. 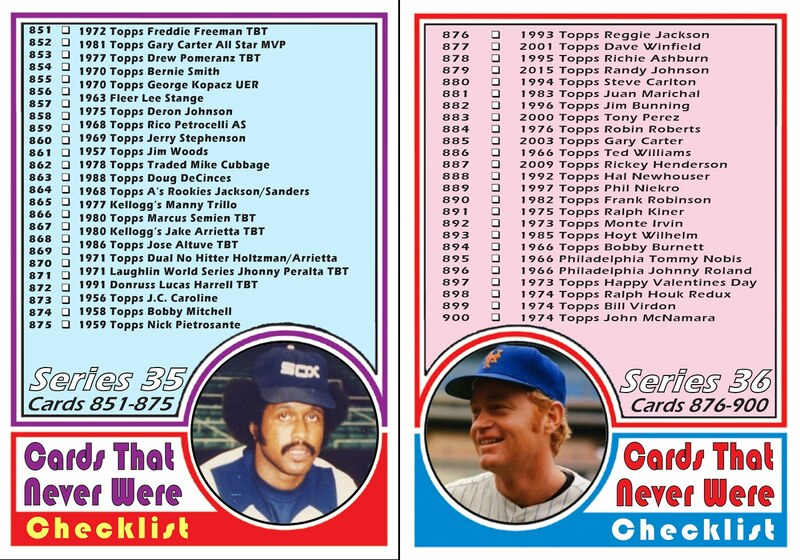 Larry Chappell Played 5 years in the Majors. 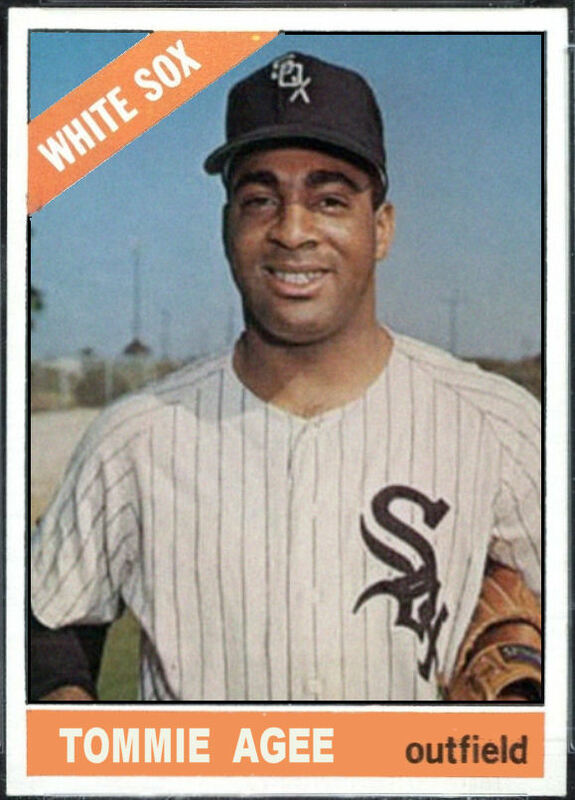 He was played sparingly and put up meager numbers for the White Sox, Indians and Braves. He was part of the trade that brought "Shoeless" Joe Jackson to the White Sox. Eddie Grant spent 10 years in the bigs. He played for the Cleveland Naps, the Phillies, Reds and the New York Giants. Bun Troy pitched one game for the Tigers in 1915. Alex Burr was a pitcher for the Yankees but made only one appearance as a centerfielder in 1914. He had no fielding chances nor any at bats. "Bally" Sharman played 13 games for the 1917 Philadelphia Athletics. 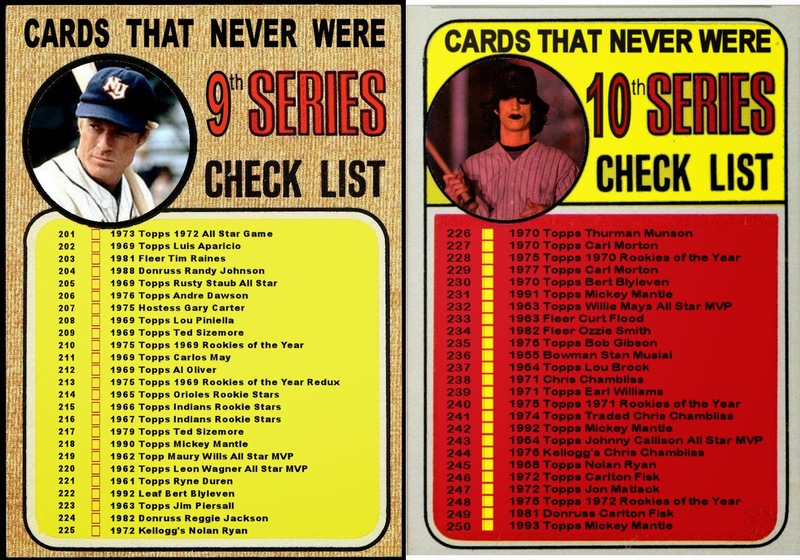 For the baseball card purists out there (first of all, why are you wasting your time on this silly blog?) I know I took a few liberties with this creation. The T202 came out in 1912, Chappell made his debut in 1913. 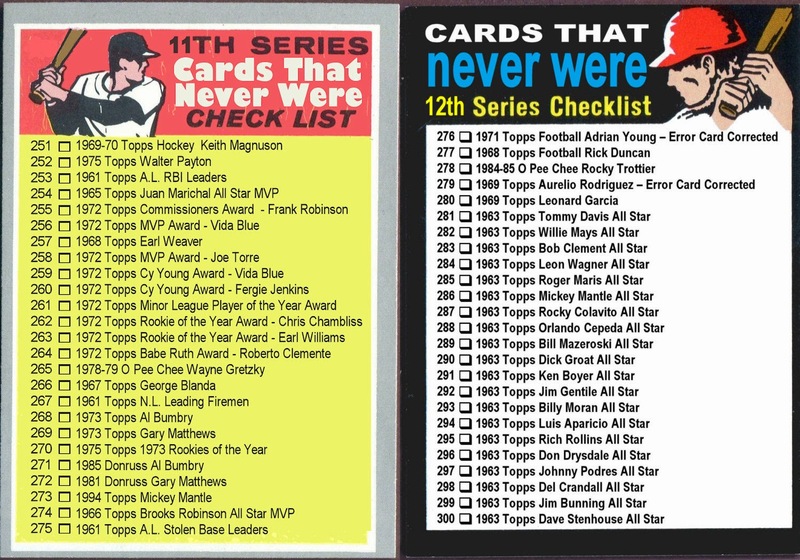 Also to the best of my knowledge American Leaguers and National Leaguers didn't appear on the same card. 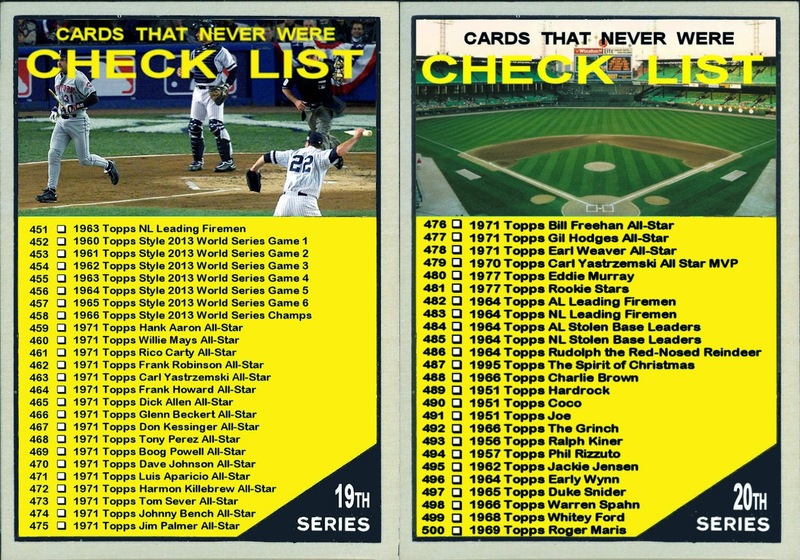 And the design I used for the Chappell side was actually from the Upper Deck version of the T202. The "action" photo in the middle is Larry Chappell and Walt Kuhn who also played for the White Sox in 1913. On this day in 1935 Babe Ruth would hit his final home run. In fact he would hit his final 3 homers. It was only the second time Ruth hit 3 home runs in one game. At 40 years old and he signed with the Braves in 1935 with the intention of moving into as Manager's position. The contract he signed gave him the title of "Assistant Manager" but he never was more than window dressing. "Spahn and Sain and pray for rain". We've all heard the saying. I didn't know that it was just paraphrasing a poem that first appeared in the Boston Post in 1948. 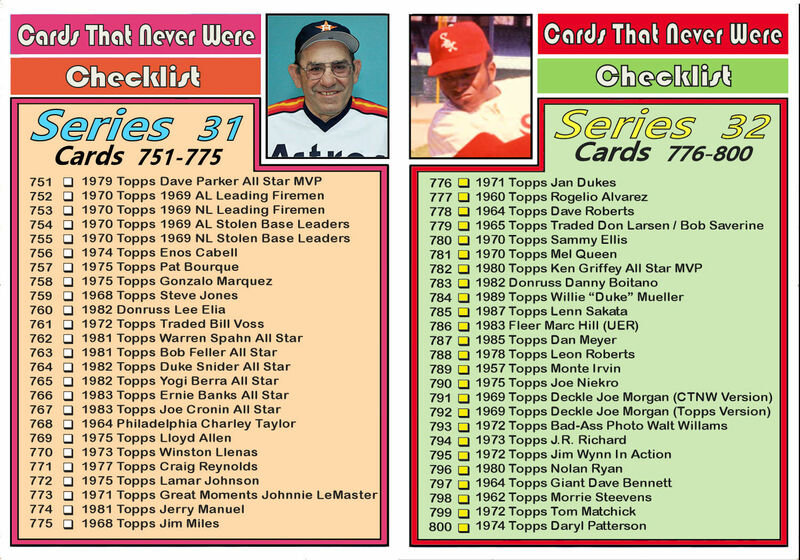 During a stretch of 10 games, Spahn and Sain each won 4 times. More amazing is that they pitched complete games in every start. In fact they pitched in 2 double headers in a row, September 5th and the 11th. Separated, I assume by rain. 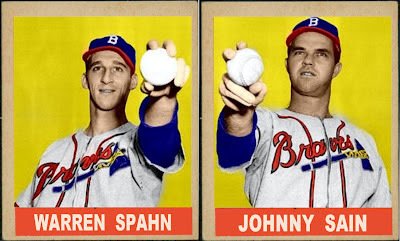 While the two were teammates, Spahn was more consistent, but Sain was considered the staff ace. 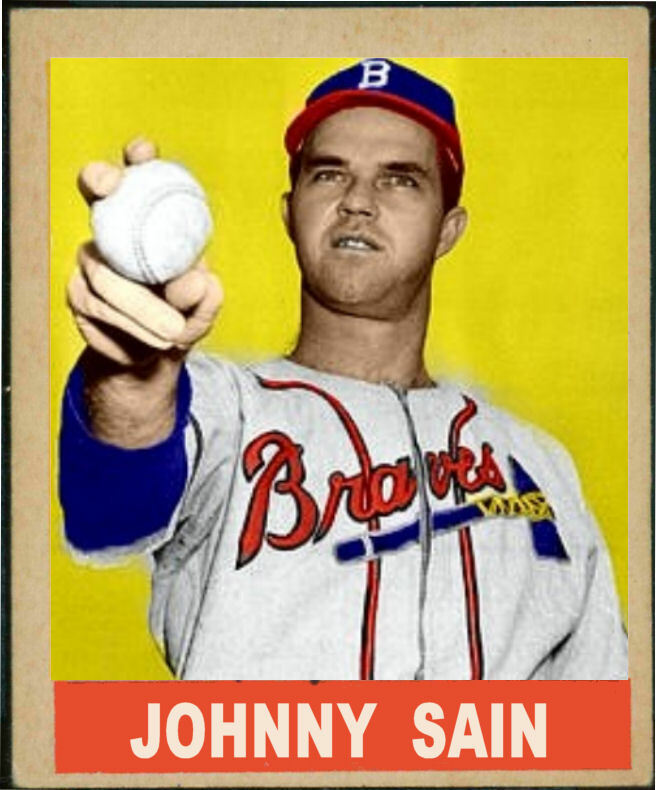 From 1946-1951 Sain was the opening day starter 4 times, Spahn once and Vern Bickford once. In 1948 the Braves won the NL Pennant but lost to the Indians in the World Series. Sain was runner-up to Stan Musial in MVP voting with 24 wins and 28 complete games. 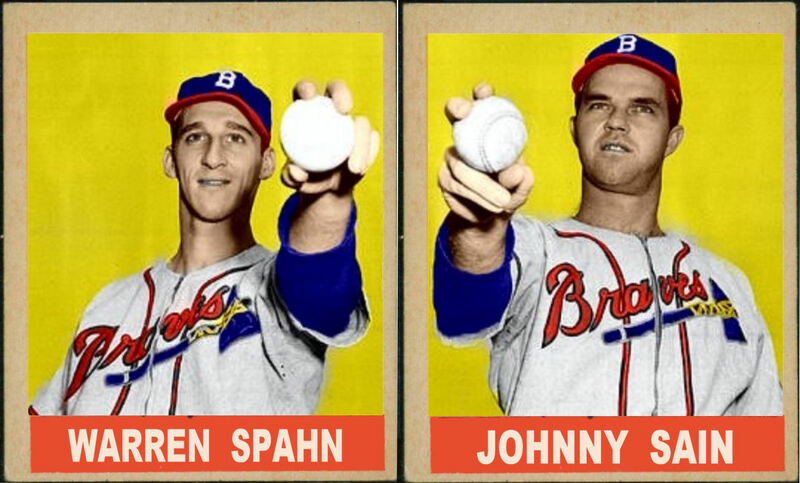 I had originally planned to make bookend 1949 Leaf cards of Spahn & Sain. 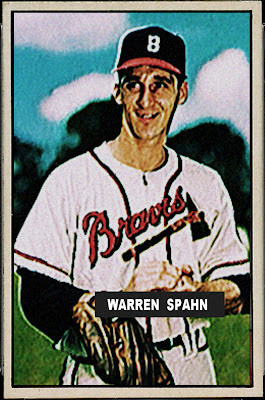 Once I realized Spahn already had a 1949 Leaf card I had make a different card for Warren Spahn. It's too bad because I kinda like the way these turned out. Warren Spahn pitched for the Braves in Boston and Milwaukee. Even though he never pitched in an Atlanta Braves uniform, he is immortalized in bronze outside Turner Field in Atlanta. Spahn is known not only for his heroics on the mound but also his heroics in World War II. Spahn came up to the Boston Braves at the age of 21 in 1942. Following the 1942 season, he was drafted into the US Army where he served with honor. He was awarded a Bronze Star and a Purple Heart and fought in the Battle of the Bulge. After 3 years in the service Spahn returned to baseball. He went on to be selected to 17 All Star teams, led the league in victories 8 times, ERA 3 times, strikeouts 4 times, shutouts 4 times and complete games 9 times. He also hit at least one homerun in every season from 1948-1964. OK this post started as a 1949 Leaf Warren Spahn because I looked at a website that I use for reference and it had Spahn listed under Boston Red Sox. 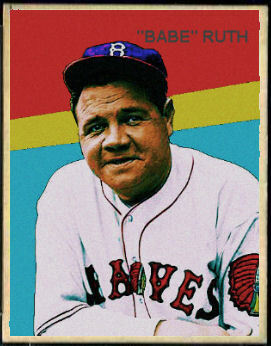 Not the Boston Braves, so I made another card this time a 1951 Bowman. Guess what? That already exists too. 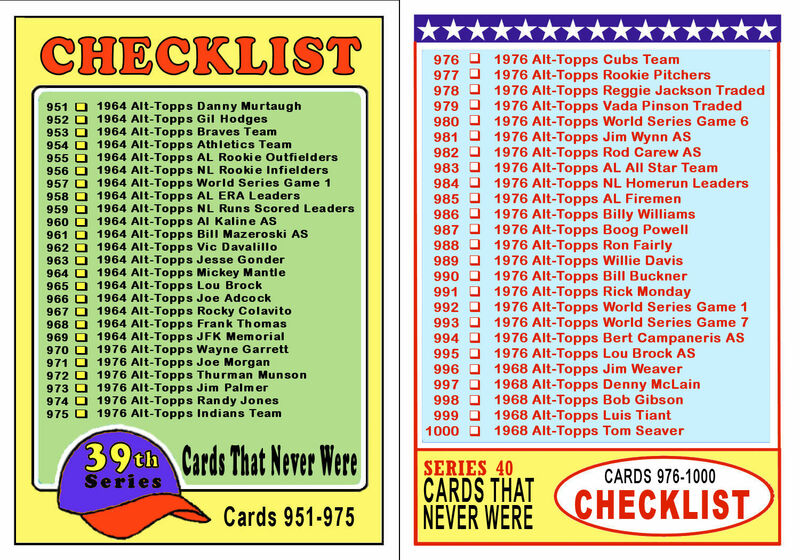 In fact Spahn is on every single Leaf, Bowman, Topps, Red Man and Berk Ross card during his Boston Braves years. I officially give up. I can't think of another way to portray Spahn as a Boston Brave. 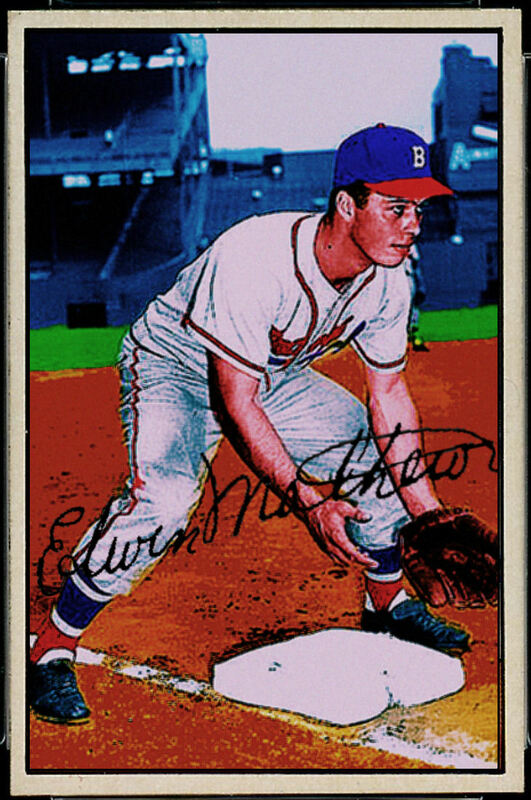 Eddie Mathews is the only player to play for the Braves in Boston, Milwaukee and Atlanta. He is a member of the Hall of Fame and a member of the 500 Homerun Club before steroids when hitting 500 was still an incredible feat. One of his greatest contributions as a player was providing protection for Hank Aaron (the real Homerun King). He batted 4th behind Aaron, not allowing pitchers to pitch around Aaron. 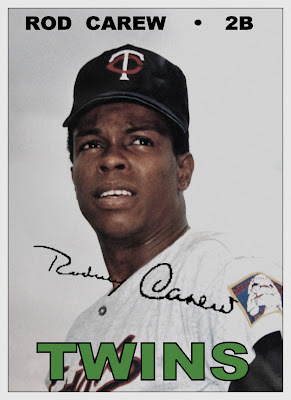 It was the same role Mantle played with Maris when he set the single season homerun record. It was also the same role Lou Gehrig played for Babe Ruth. Mathews played in the Boston Braves minor league system in Atlanta and Milwaukee (both locations would eventually be home to the Major League Braves). 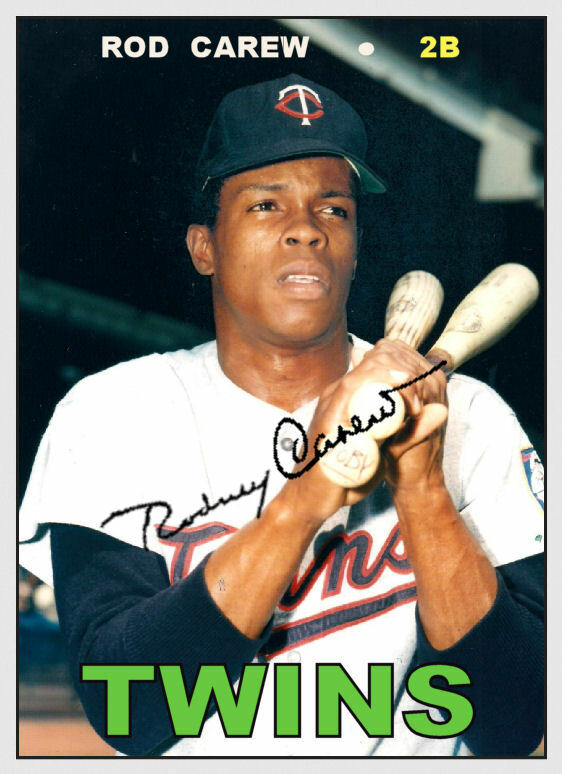 At the age of 20 he joined the big league club and swatted 25 homeruns. He received votes for both Rookie of the Year and MVP in 1952. He would be runner-up in MVP voting in 1953 and 1959 falling short of Roy Campanella and Ernie Banks respectively. He also led the league in Homers both years. He would be selected to 12 all-star teams and receive MVP votes in 10 different seasons. He was elected to the Hall of Fame in 1978. 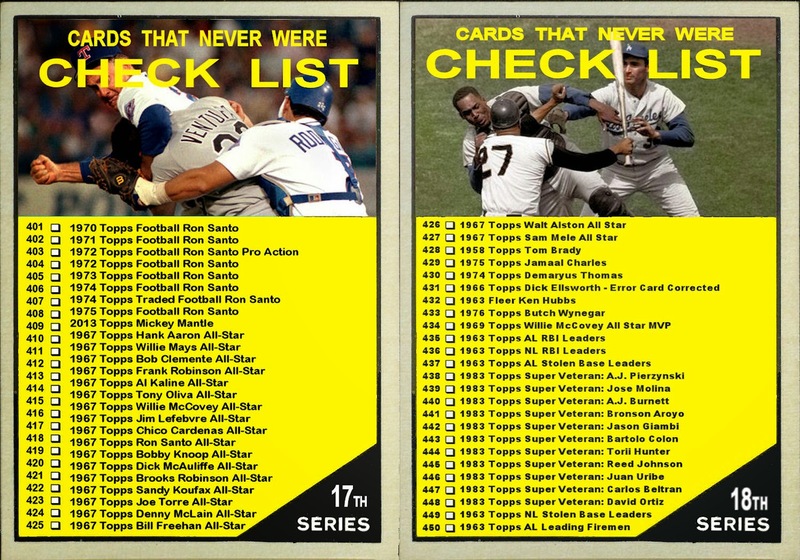 Here is a continuation on a theme of putting together 5 "Cards That Never Were" favorites from each team. I broke the Braves down into 3 separate eras. Boston, Milwaukee and Atlanta. Here are the favorites from the Boston era. 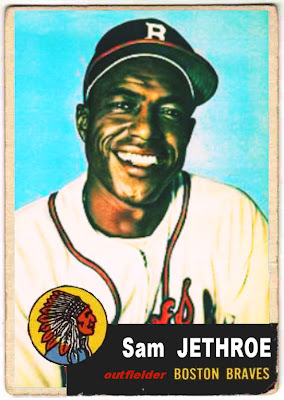 Sam Jethroe was the first black player in Boston. He was selected Rookie of the Year in 1950 at the age of 33 although he was believed to be only 28 at the time. He led the National League in stolen bases in 1950 and 1951. In 1952 he came in second to Pee Wee Reese and in 1953 he spent the season playing for the Braves minor league team in Toledo. He batted .309 with 28 homers and 27 stolen bases. At the end of the season he was traded to Pittsburgh where he saw limited action in 1954. He would continue to play minor league ball in Toronto until 1958. 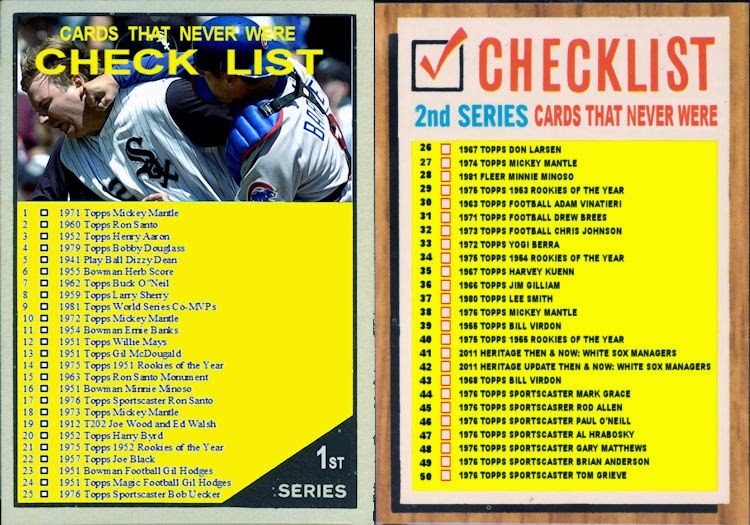 Once again, here are all the cards from my 7th series set to some catchy tunes. You can see more than a month's worth of cards in a couple minutes. This checklist proves how easily distracted I get. First I found a cool picture of Satchel Paige. Then I became interested in the story behind the picture and did a few posts on the MLB pension. That in turn got me interested in the Hairston baseball family. 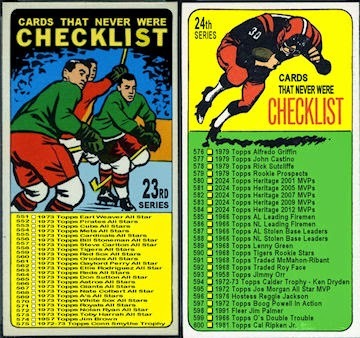 Then there was Humber's perfect game, the Chicago Blackhawks 5th consecutive overtime playoff games, and the unfortunate passing of Moose Skowron. I could go on about being easily distracted but I think I see something shiny. 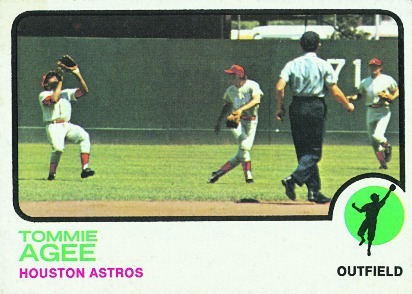 Last week in my post about Tommie Agee I pointed out that Rusty Staub made a guest appearance on his 1973 Topps card (airbrushed into an Astros uniform). 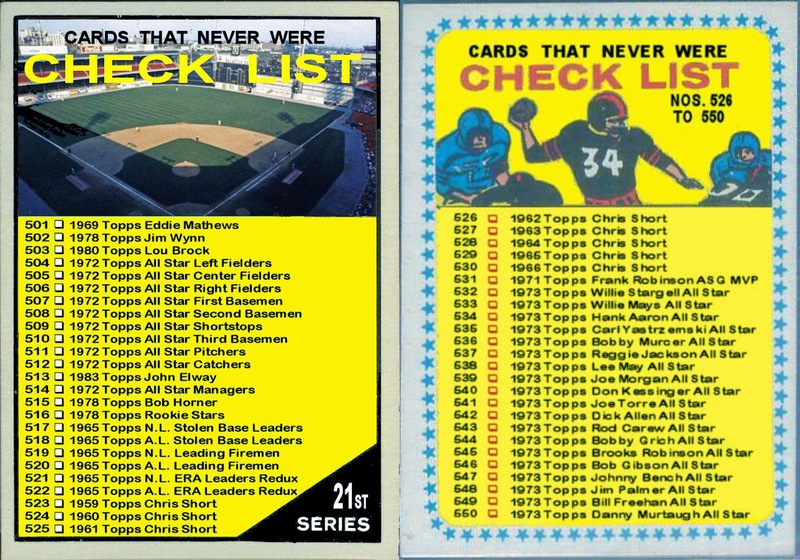 Staub, however, didn't have his own Topps card in 1972 or 1973. The 1973 set is one of my favorites. I especially like the horizontal action shots like Agee's. 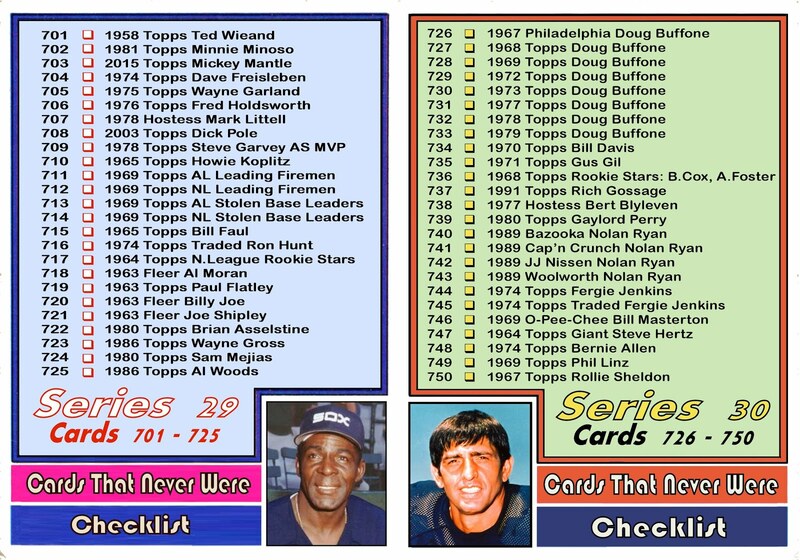 So I jumped at the chance to fill in Staub's missing 1973 card. 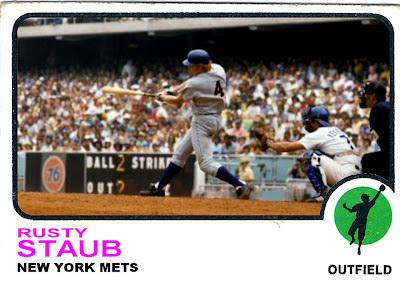 If you'd like to see a 1972 Topps card of Rusty Staub follow this link to Mets Guy in Michigan. Rusty Staub had an incredible post season in 1973. Although he had only 3 hits in 15 at-bats during the NLCS, all 3 of those hits cleared the fences. In the World Series he would bat over .400 and have a monster Game 4 going 4 for 4 with 5 RBIs and a homer to tie the series at 2 games each. That game was immortalized on cardboard in the 1974 set. Again using the horizontal action shot format. 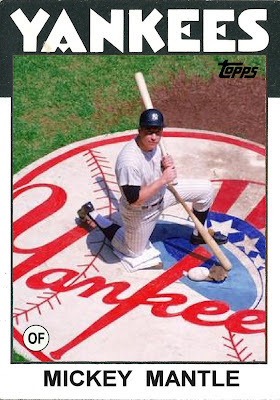 I found the 1986 set exceptionally bland so I may have overcompensated trying to find a colorful Mickey Mantle picture. Getting into a pattern here. 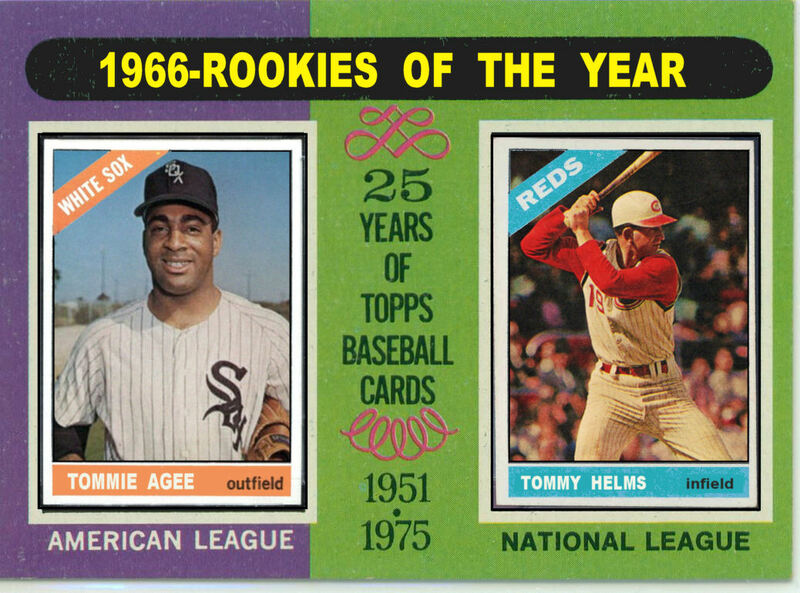 Both Tommy Helms and Tommie Agee appeared in the 1966 Topps set on multiplayer "Rookie Stars" cards. Not only that but they both also appeared in the 1965 set. Also on multiplayer "Rookie Stars" cards. Both players played in 2 All Star games and each were awarded 2 Gold Gloves. Their paths would cross in 1973 when both played for the Houston Astros. 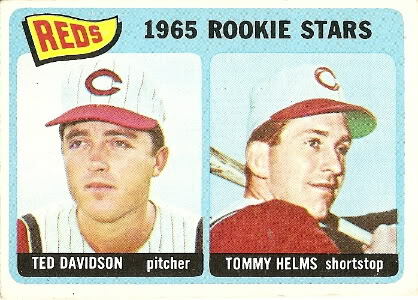 Tommy Helms was the 1966 NL Rookie of the Year. He played for the Reds until the 1972 season when he was traded for the 1965 NL Rookie of the Year runner-up, Joe Morgan. Seemed like an even trade. Before the trade both players had 2 All Star selections. For Morgan both times were as a reserve and only seeing action in one game. Helms had one game as a starter and one as a reserve. Helms also had 2 Gold Gloves. Morgan provided more speed on the basepath and hit more homers. In the 8 seasons following the trade, Morgan would appear in all 8 All Star games, starting in 7 of them. He would also win 5 Gold Gloves and 2 MVPs. After the trade Helms would not appear in another All Star game or win another Gold Glove. He played 4 years in Houston then finished out his playing career with short stints in Pittsburgh and Boston. 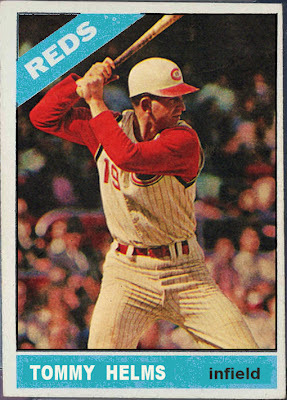 He would return to the Cincinnati Reds as a coach in 1983. Eventually he would be the replacement manager for Pete Rose in 1988 when Rose was suspended 30 games for pushing an umpire. 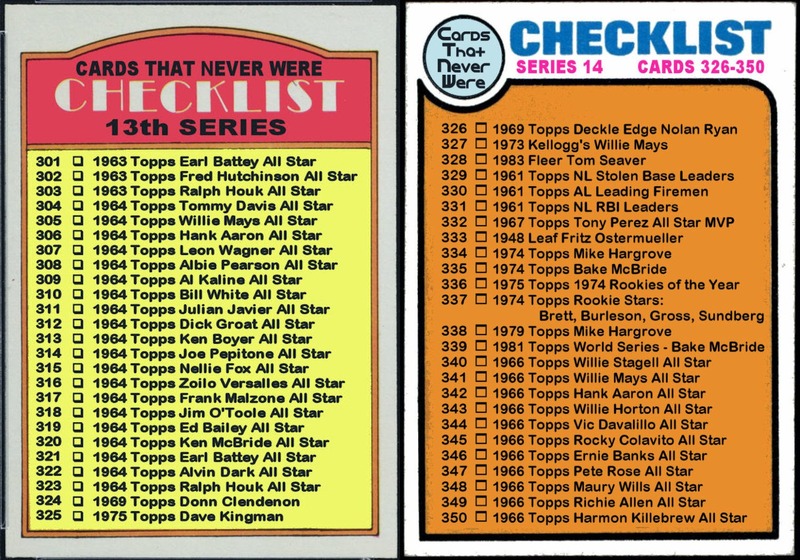 Then again in 1989 when Rose was banned for gambling on baseball. In all Helms would manage 64 games in 1988 and 1989 with a 28-36 record. In 1990 he was replaced by Lou Piniella and the Reds would sweep the A's in the 1990 World Series. Congrats on half a million hits. Check out his blog and enter to win free cards! 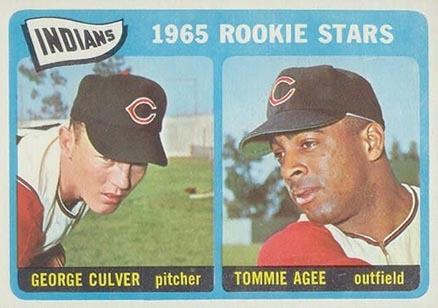 Tommie Agee made his major league debut in 1962. He also saw limited big league action in 1963, 1964 and 1965 all before earning Rookie of the Year honors in 1966. 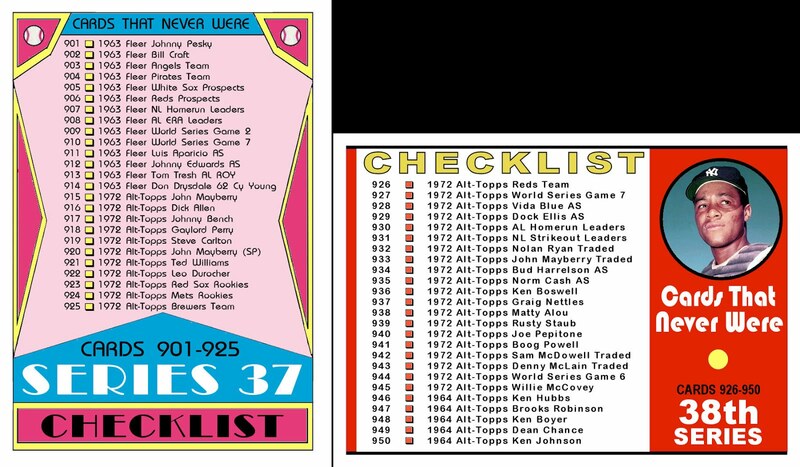 Agee was well represented on Topps cards. 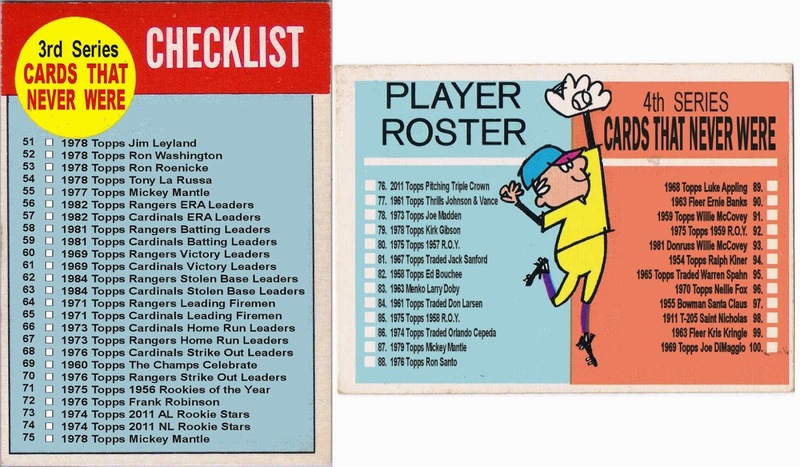 He appeared on a 1965 "Rookie Stars" card the year before his R.O.Y. season and appeared on 2 cards in 1974 despite playing his final game in 1973. After the 1973 season he was dealt from the Cardinals to the Dodgers. 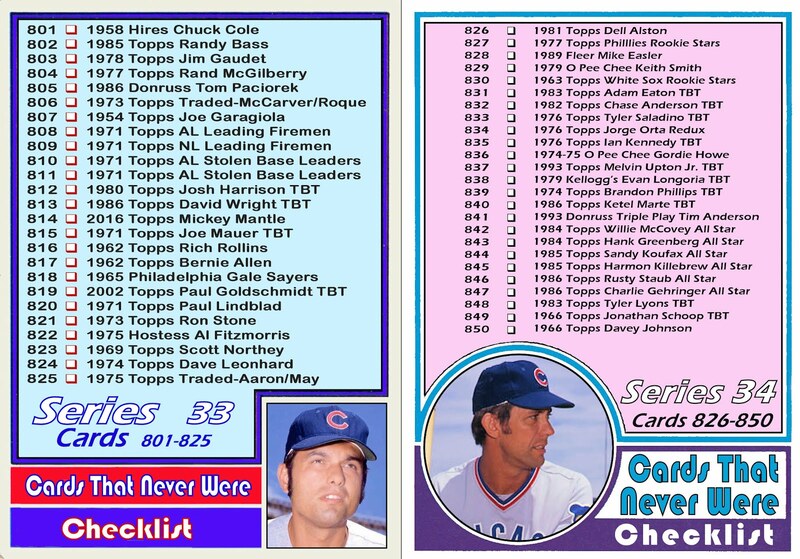 Topps made a 1974 card of him in a Cardinals uniform as well as a Traded card depicting him as a Dodger. Agee was cut by the Dodgers during spring training that year. Perhaps the most interesting card of Tommie Agee is his 1973 Topps card. In it he is airbrushed into an Astros uniform along with two of his New York Mets teammates. One of whom is Rusty Staub. 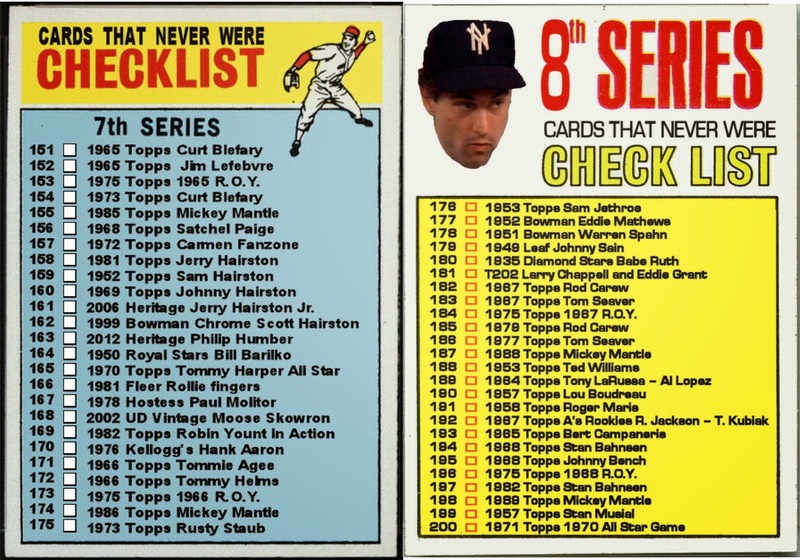 Staub was conspicuously missing from Topps cards in 1972 and 1973 despite coming off an All Star season in 1971. 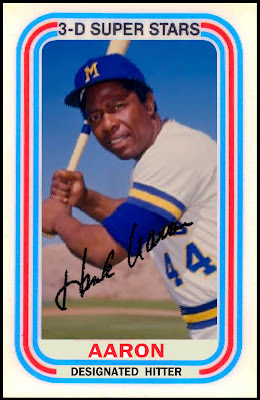 Although Hammerin' Hank spent only 2 years in the twilight of his career in a Brewers uniform, he had played 12 years as a Milwaukee Brave in County Stadium. By the time Aaron retired in 1976, the Brewers still hadn't finished above 5th place in the division let alone finish above .500. The addition of the newly crowned Home Run Champ bolstered attendance. In 1974 attendance was 9th place out of 12 AL teams. In 1975 it was 3rd despite losing 8 more games. 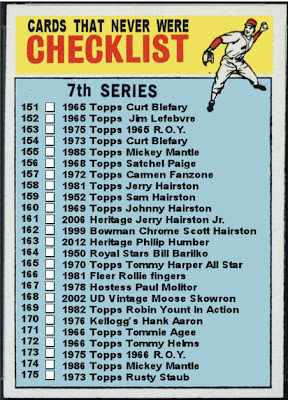 I can't understand why Hank Aaron was never on a Kellogg's card. 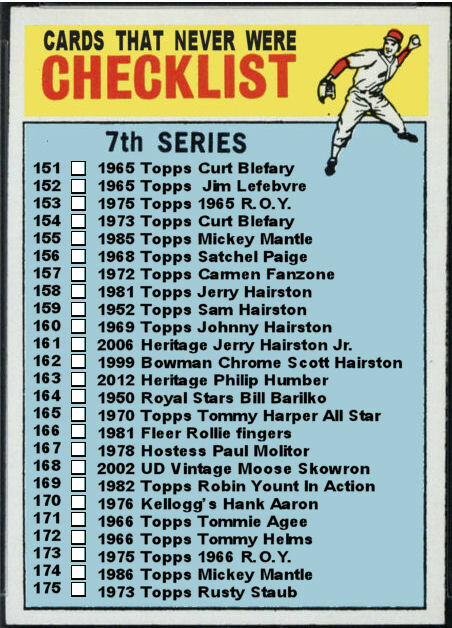 Kellogg's produced cards from 1970 through 1983. Aaron was one of the most popular players during that time. Robin Yount is synonymous with the Milwaukee Brewers. He played his entire 20 year career in a Brewers uniform. He was selected to 3 All Star games, won 3 Silver Slugger, a Gold Glove award and was the American League MVP in 1982 and 1989. 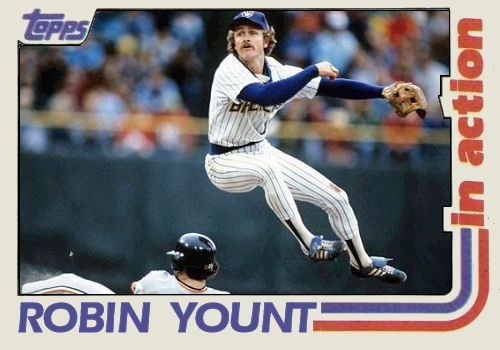 In 1982 he had career highs in homeruns (29), RBIs (114) and batting average (.331). He also lead the league in hits, doubles, total bases and slugging percentage.